Stunning new 3D Hologram Projector wows at trade show. Several years ago the Wheelabrator Group featured a 3d hologram projector as a feature at their trade show booth. 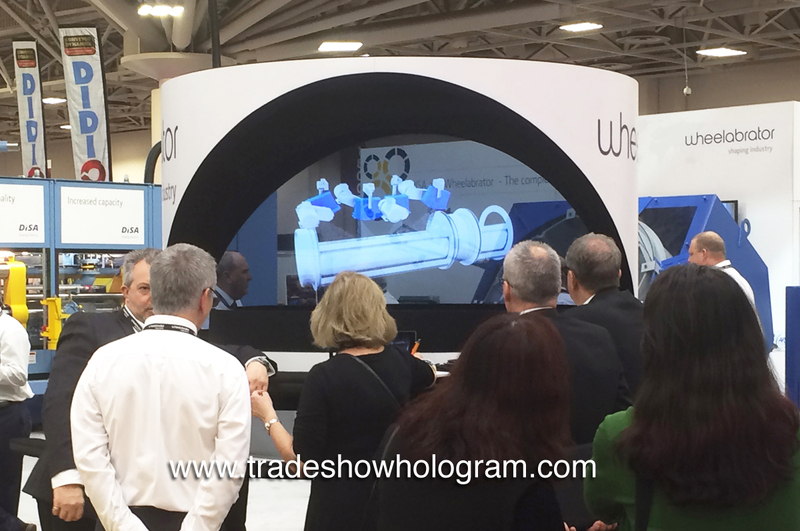 Based on the excitement created by the hologram display, they included a hologram display in their next trade show. Recently they contracted Trade Show Holograms to create a larger version of a hologram projector to be used for an upcoming show. ( CastExpo 2016 ) The result was a larger hologram, a brighter hologram ( using our advanced new projection system ) and an an interactive touch screen that allowed the viewer to call up selected holograms on demand. The larger version is the first to include the interactive touch screen which will now become a standard in all displays created by Trade Show Holograms for sale and rental across North America. The newest large version hologram with ultra bright projection.